Yesterday, I became a woman. But how is that possible, you might wonder, since my Bat Mitzvah was more than a few moons ago? Didn't I get my child bearing hips that very "beshert" Saturday in November so many years ago? Well, this is a different kind of development. On this fine spring day, I bought my first true laptop bag. Can you hear the bells chime? Then I moved onto using my beloved Leigh & Luca tote, which I managed to rip after adding too many hardcover books to the mix. (Yes, I am the one person in America who still buys actual books). I found myself sans functional carry on in the middle of the Miami airport. Clearly, it was time for an investment in the real thing, instead of turning perfectly lovely totes into destroyed laptop bags. I arrived at Fred Segal Santa Monica for a party celebrating the launch of Daily Candy LA Deals and suddenly remembered that – amidst gratis Stila makeover and O.P.I. manicure stations – sat design store Zero Minus Plus. And I had a credit I'd been meaning to use. Suddenly remembering that you have a store credit is like finding cash in the pocket of an old jacket or pair of jeans – genius! Once I walked into the store it only took a moment for the above ro bag to seduce me. 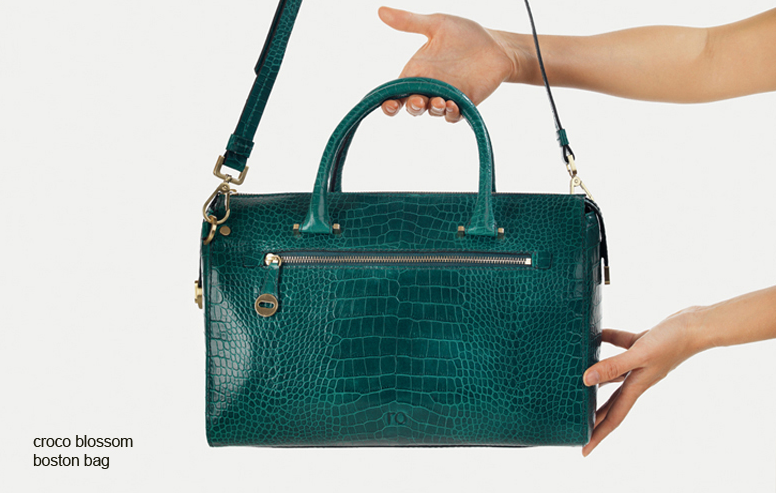 In the past, most other computer bags had looked too masculine, corporate or, well, heinous, but this one – in bright green leather with sweet polka dotted lining and pockets galore – screamed my name. 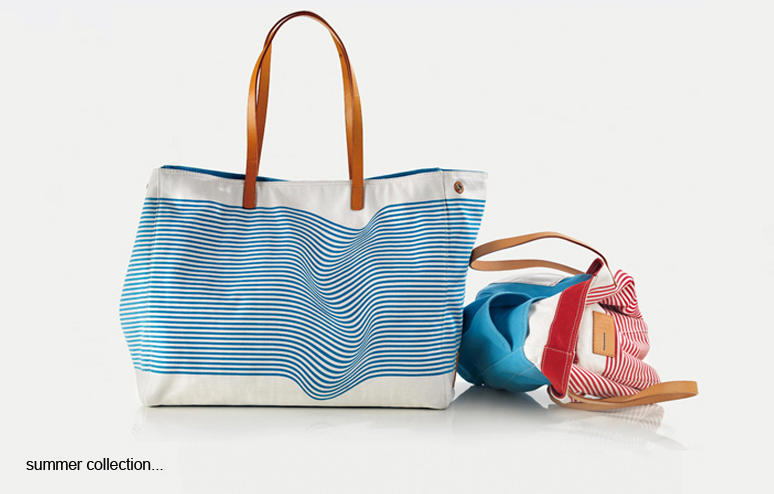 Actually, so did the company's summer "Wave Bags" (LOVE! See below! ), but I figured one bag was enough per day. See, women, unlike girls, show self-control. At least for now. P.S. 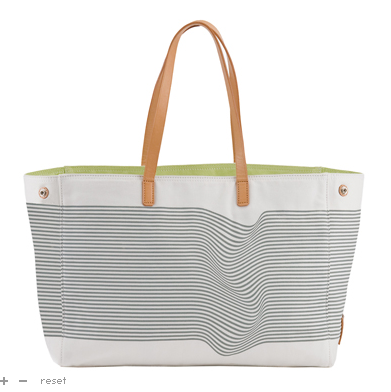 This Wave Bag below is called the "Meg Tote" and I think my friend M. should buy it immediately! Just wanted to post links to a few of my latest on-line stories, as they may be of interest (or at least, it may be of interest to me for you all to read, re-tweet, FB etc.). Impressed? I'm working with my therapist to make my needs known. And, by therapist, I mean facialist. LA (THIRD STREET): Roasted Peeps Revealed! I'll start out by apologizing: The above is obviously not an image of a roasted Peep. The problem is that Peeps are cute and, once I started roasting one, it seemed a little twisted like I was melting a little smiling bird. So, I decided to spare you all that and just describe the experience. In a word: Awesome. 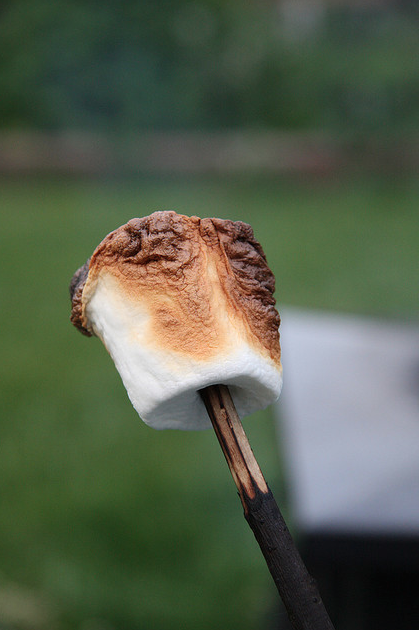 It turns out that roasted Peeps are just like elevated regular marshmallows. The inside is all good and mushy like normal, but the sugary outside turns into this crispy shell a bit like the top of creme brulee. Okay, so here I was seconds from telling you all about my most amazing find: Chocolate-covered Peeps at Joan's on Third. I was going to talk about being a Cadbury Cream Egg devotee with an occasional penchant for Peeps (only when stale). But, then, I went in search of an image for this post because, per usual, I ate the entire delicious package before I remembered to take a picture and I discovered that Peeps themselves have had the same brilliant thought as my local gourmet market (though surely in a less upscale incarnation). The whole investigation provoked some serious contemplation: If Peeps could be successfully dipped in chocolate than how else could we innovate them? Their website posits recipes for Peeps macaroons (for the Jews!) and rice crispy treats, but those seem just to entail tacking the yellow and pink marshmallows on at the end. Let's get serious and ask the hard questions: What in fact happens if you roast a Peep? Like any mostly sane person, I have been a dedicated Urth Cafe fan for as long as I've lived in or near LA. When I left for college in California, my parents also moved to LA (sort of a coincidence and a long story). But I still went home to NYC for holidays to see my friends. Otherwise I worried my legs would atrophy from never walking. ANYWAY, when I would return to the sunny left coast with my joints greased, my parents would pick me up at the airport and whisk me off to Urth Cafe. That always felt like my official re-entry into my sanctified Cali world. Even after all these years, I don't often stray from my Urth Salad order (feta cheese, hearts of palm, chickpeas, olives, a baguette on the side – what else does a girl need? ), though sometimes I do add a sticky bun at the end for dessert. SO chewy and wonderful! But yesterday, I noticed that they'd added these boba teas to the menu. Now, that in itself is not so special, since boba tapioca balls had a Pinkberry level moment in LA several years ago. 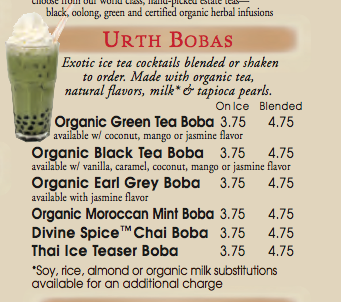 But at Urth Cafe, not only are they using good high-end ingredients, but you can opt for soy, rice or ALMOND (yay!!!) milk instead of regular in your blended boba drink. In short, as a lactard, I can still drink these mofos. I used to be able to get a soy version at Zen Zoo, but – alas – that place is no more. (R.I.P.!) This is even better anyway cause it's almond milk (or so I keep telling myself). I have TOTALLY gotten on board for the almond milk trend, which is also having a Pinkberry level moment, as we speak. At least until someone decides that too many almonds are toxic and cause wrinkles, dysentery and erectile dysfunction. But for now I be chillin' with my boba in hand.